Today, after I had caught the scorpion that had stung Esme in our house, she muttered to the animal that it was not nice stinging her, because her star sign is Scorpio. We both where amazed at having such an animal in our house. Esme said that the animal was called alacrán and wasn't a scorpion. But the word means scorpion in Spanish and there was no doubt about it to me that I caught a real scorpion. We went to the Cruz Roja (Red Cross) just to be sure. I had no idea if the animal was poisonous. So I kept asking Esmeralda if she was feeling OK. Gladly she was not feeling dizzy, nor feeling a tingling or a numb sensation in her arm. She was just hurt. I took the captured scorpion with me so the medical people could have a look at it. However, later I read that it is quite hard to determine scorpions by just looking at them. At the Red Cross they told us that the scorpion's sting was not dangerous. The wound was cleaned and she got a recipe for anti-histamines. I was quite scared because this was my first experience with a living scorpion in action. Last Saturday, we had seen scorpions and spiders at "El Mundo the los Arácnidos" in the Jardin Botanico Clavijero. There the idea had formed in my mind that it would be nice to have a few scorpions as "pets" or a big Tarantula spider. I was joking with Esme that she had found me a nice mexican pet, and that it was not dangerous, because she had checked it out. I told her about the much bigger scorpion I had seen in Sri Lanka, back in February 1999. It was about 15 cm. However it was dead, lying on the road. Back in the house I checked under all cushions, and the fireplace. The latter has four stones holding the grate with a lot of dry wood. A likely place for scorpions to hide. However, I found nothing. I named the scorpion Tina because someone with that name hasn't been nice to a good friend of mine. Scorpions - habitat, behavior, life cycle, etc. Using Google, I found some interesting facts about scorpions. For example how they glow in the dark when exposed to UV light (black light). It is even recommended as a method for discovering or even hunting scorpions at night. Many scorpions are nocturnal, meaning they are active during the night. I had some experience with the pseudo-scorpion in New Zealand. But those are only a few millimetres in size, hence hard to see with the naked eye. Also, they have no stinger. 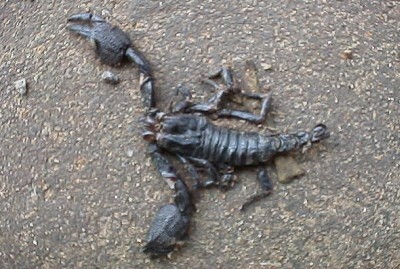 I kept one for some time as a pet, and it was amazing to see it move about like a real scorpion. When I was a little boy, I always got the goose bumps when I caught a water scorpion. However, the thing that looks like a stinger is used by the animal to get air, and the animal is not related to scorpions at all.